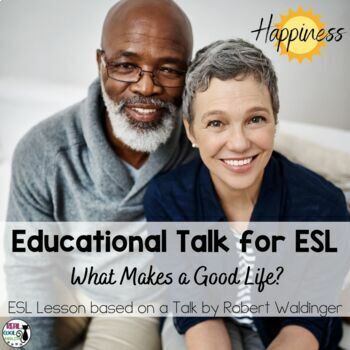 ESL Lesson for TED Talk: What Makes a Good Life? 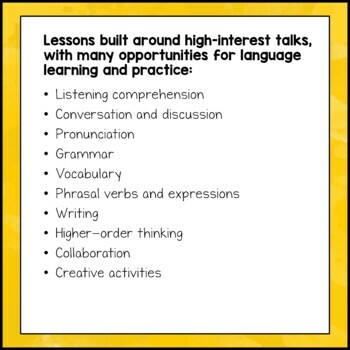 ESL Lesson: Based on a TED talk by Robert Waldinger and designed for upper intermediate to advanced ESL learners to practice listening, speaking, reading, writing, vocabulary and grammar skills. Discussion questions encourage higher order thinking. ✤ Three separate vocabulary activities: collocations, phrasal verbs, and understanding meaning from content. 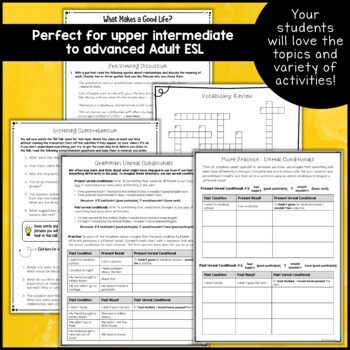 Concepts are introduced and students use accompanying activities to practice and reinforce the vocabulary. 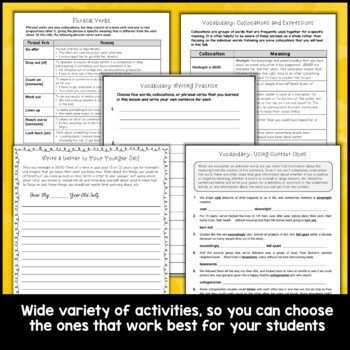 ✤ Download includes 12 lesson pages and 4 pages of notes and answer keys. ► Or better yet, purchase the bundle and save! If you purchase this product, your feedback would be greatly appreciated!! Please go to your My Purchases page. Next to each purchase you'll see a Provide Feedback button. Simply click it and you will be taken to a page where you can give a quick rating and leave a short comment for the product. Each time you give feedback, TPT gives you feedback credits that you use to lower the cost of your future purchases. Additionally, your feedback is very important to me as it helps me as I am creating new products.